The Zambia National Farmers Union has welcomed agriculture minister Michael Katambo’s directive to review the laws governing the tobacco sector to bring harmony to the industry. Katambo directed his Permanent Secretary Songowayo Zyambo to immediately start to immediately embark on a process of reviewing Statutory Instruments 67, 84 and 85 in full consultation with all stakeholders. ZNFU President Jarvis Zimba said ZNFU would support the changes intended to deal with challenges affecting the entire tobacco value chain. He said farmers were elated that tobacco marketing would soon open for them to begin selling the crop which was stuck on farm. Zimba further said that the reopening of consultations on the Statutory Instruments and review of the tobacco legislation should bring harmony to the industry. “The diversification of the Zambian economy is not just an option but it is a make or break situation and is dependent upon vital sectors such as agriculture which is a springboard of many industries through value addition, suppliers of agro-services, transporters, the banks and many more,”he said. 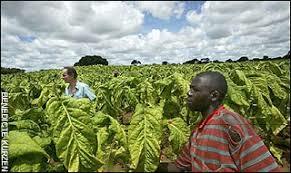 Zimba said a booming agriculture sector is a source of income to its people and to the Zambian economy. “We will work hard to bring on board the tobacco growers of all sizes and those dealing with the growers to participate in the review process of the laws so that a firm foundation is in place. We are keen to perform this role because we know that when the tobacco industry collapses, farmers stand to lose out and poverty is highest in the rural areas,” he added.